TT Patton’s Going Corporate – Write with us! A couple of years ago one of my clients purchased 30 leather journals for her board meeting and we personalized each cover with the member’s name and tenure. They were so well received she returned and purchased 30 designer pens all in different designs, for last year’s board meeting. I can’t wait to see what we come up with for this year’s board meeting. Boy will she be surprised when she meets our new Corporate Sales Director, Angela. With over 10 years of experience sourcing couture and luxury corporate gifts, she’s well suited to meet the demands of our existing and future corporate clients. To get ready for the corporate buying season, we’re expanding our inventory of creative gifts, selected with executives in mind. Not just portfolios and memo pads, but personalized leather goods and stationery, designer fountain pens, watch and pen cases made of fine woods, holiday greeting cards, and much more. We want to dress the executive suite and small business entrepreneurs with business writing accessories that they are proud to display but feel comfortable using. Our expanded client base will not just be purchasing departments and large institutions. Our “new clients” probably already know about TT Patton for fine products and writing programs. 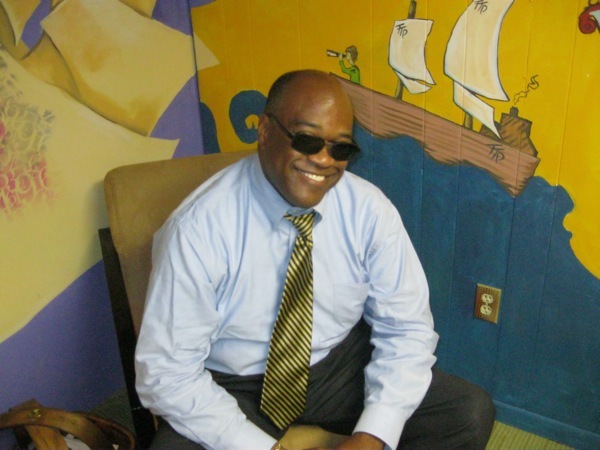 For example, meet one our corporate clients, Jesse M. Patton, Jr., Esq. He’s a big fan of TT Patton’s student writing programs and we’re his first stop after work when he’s looking for a gift for a colleague or friend. 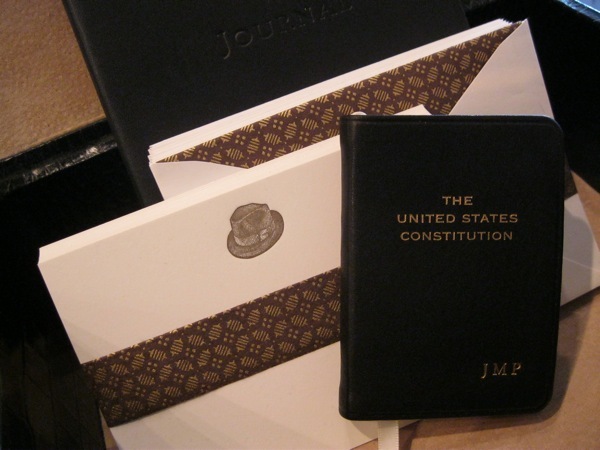 His latest gift was a leather-bound, pocket-sized version of the The United States Constitution with gold gilded pages. He knew it would be a big hit because he has one himself, personalized with his initials of course. I hope our new corporate focus will give you another reason why TT Patton should be high on your list of 365 Things to Do in and Around Barrington! Thank Liz. The stationery in the photo is a letter press design from Bell’Invito. They have many available images but will also do custom designs. Stop in sometime and I can show you more. I’m with Liz–very exciting! Also, JP is a perfect poster-boy for the promotion. I love that shot of him! I hope he likes it. He’s the perfect corporate client. On behalf of the Board of Managing Trustees, I would like to express our thanks to Angela, your new Corporate Sales Director, for her help and suggestions in choosing napkins for our cocktail party that takes place this month. She was a joy to work with and very professional. Thank you Madelaine! We’re happy to have Angela as part of our team. And just let her know if we can help in any other way. Have a wonderful event. Fantastic post! This is very informative and has some very interesting points! As you know employees are the backbone of any company. So keep happy to your employees. Corporate gifts are the best option to make their employee happy. If u want to see their employee happy then visit our website. We are growing supplier of corporate gifts in India. We are selling B2B promotional mugs, promotional pen drives, custom t-shirts etc.